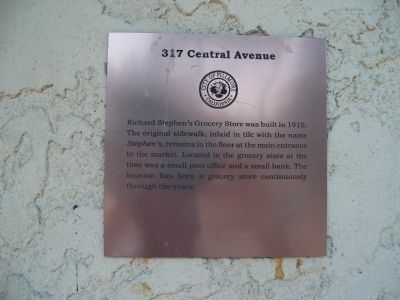 Richard Stephen's Grocery Store was built in 1910. 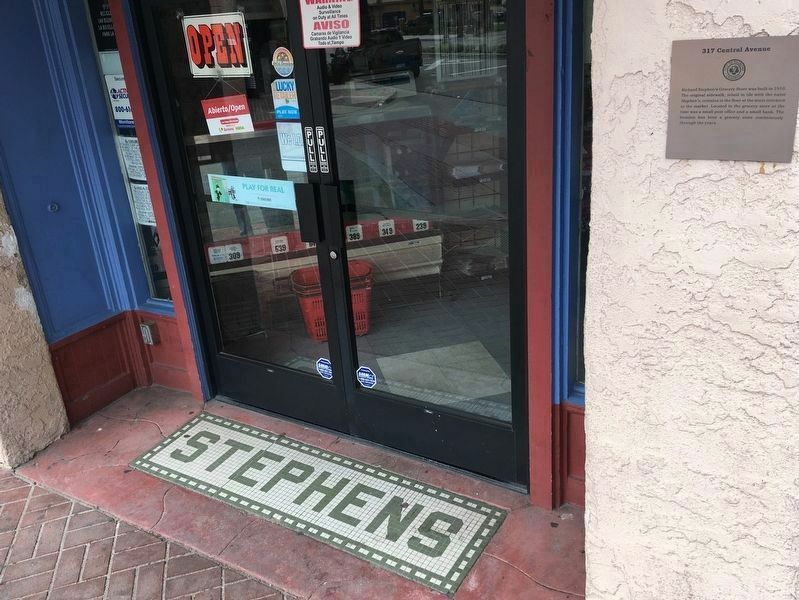 The original sidewalk, inlaid in tile with the name Stephen's, remains in the floor at the main entrance to the market. Located in the grocery store at the time was a small post office and a small bank. 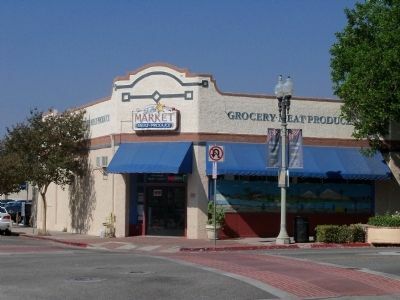 The location has been a grocery store continuously through the years. Location. 34° 23.953′ N, 118° 54.82′ W. Marker is in Fillmore, California, in Ventura County. Marker is at the intersection of Central Avenue and Main Street, on the left when traveling north on Central Avenue. Touch for map. Marker is at or near this postal address: 317 Central Avenue, Fillmore CA 93015, United States of America. Touch for directions. (within shouting distance of this marker); 348 Central Avenue (about 300 feet away, measured in a direct line); Fillmore's First Bank & Masonic Hall (about 400 feet away); 362 Central Avenue (about 500 feet away). Touch for a list and map of all markers in Fillmore. More. Search the internet for 317 Central Avenue. Credits. This page was last revised on March 25, 2019. This page originally submitted on October 12, 2014, by James King of San Miguel, California. This page has been viewed 327 times since then and 22 times this year. Last updated on March 24, 2019, by Craig Baker of Sylmar, California. Photos: 1, 2. submitted on October 12, 2014, by James King of San Miguel, California. 3. submitted on March 24, 2019, by Craig Baker of Sylmar, California. • Andrew Ruppenstein was the editor who published this page.